Things have been busy the past few months, so I guess the blog sort of slipped from my mind. I will TRY to make a few more entries in the coming new year. I only thought of it this morning because I have something exciting that I want to share. About a month ago, a friend asked if I would be interested in doing a belly painting for her sister-in-law, who is expecting in February, 2013. It's not something that I normally do (I've only ever done one before) but I accepted. I was asked to come up with a design that incorporated her Bajan (Barbados) roots, the dad-to-be's British roots, the face that he was a musician and her favorite animal - the penguin. If you're not familiar with I Spy Montreal, here it is in a nutshell: I Spy Montreal's weekly newsletter delivers a roundup of weekend events and activities right to your inbox. The newsletter gives you information about children’s plays, movies, musical performances, workshops, fairs, festivals and seasonal events. I received my first newsletter by email a couple of days ago and my head was spinning with all the info it contained! Festivals, plays, street fairs – the list went on! Who knew there were so many family-friendly activities going on at once? But there is little time for fun lately. For those of you who don't know, I will be moving in a few days. It has been an exhausting summer with renovations, packing up the house and all of the other prep work that goes into a move. The last time I moved houses was before I had children, so trying to get everything done with 2 young kids underfoot has been a challenge, but the end is in sight and we will be in our new home shortly. 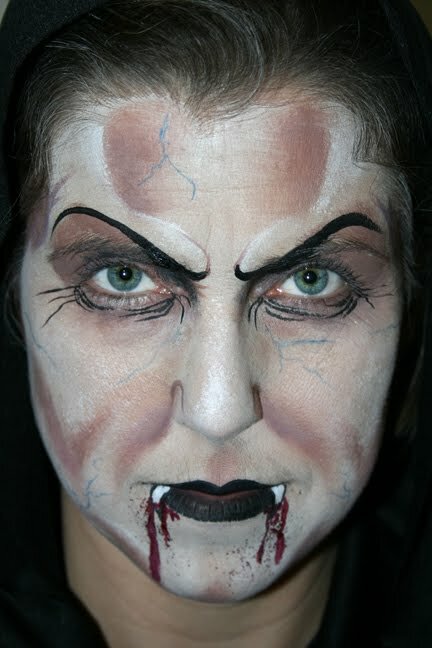 I look forward to getting back to face painting and blogging as my schedule frees up this September! 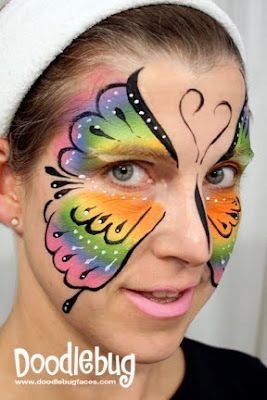 FABAIC is a yearly convention which is held in Orlando, Florida and it is THE place to go to if you are into face and body painting. It's 5 days of classes (taught by the best instructors in the industry), demos and parties and as much as I would love to go, it's probably not going to happen for another few years, at least until my children are a little older. 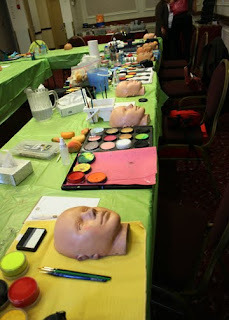 So while I'm waiting for my chance to spend a week in Florida learning everything there is to know about face painting, I'm doing the next best thing - taking classes (locally) that are being offered by some world-class instructors and artists. Last month I attended the Wolfe Brothers' (Nick and Brian) 1-day workshop in Ottawa and then I (unfortunately) had to miss out on another workshop that was given last week in Ottawa by Mark Reid. These classes are put together by Shelley Summers, A.K.A. Dotsy the Clown, who runs an entertainment company out of London, Ontario. http://www.dotsytheclown.com/ So far, all of the workshops have been given in either Toronto or Ottawa, which meant a 4-hour round trip (to Ottawa) as well as adding the cost of gas to the price of the workshop. But late last week, Shelley announced ANOTHER workshop which is going to be given less than 5 km from my house! The very talented Sean Avram will be giving a 2-day workshop (May 17th/18th) at the Best Western Hotel in Dorval and I am planning on cashing in my last banked day-off with work to make it to this one! Check out Sean's website and if you are in the Montreal area, try to make it to his workshop! I hope to be registering for it tomorrow and I'll try to get some photos from the workshop up in my next post! I am often asked what got me interested in face painting, and I tell people that as a graphic designer, I usually sit in front of a computer screen for 7-8 hours per day (and have done so for almost 20 years!). 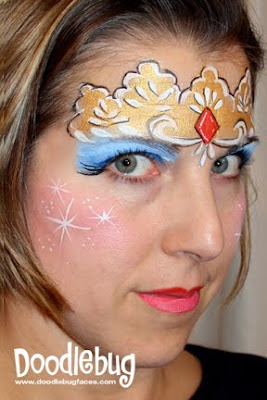 Face painting allows me to "get my hands dirty", interact with people (I work from home!) 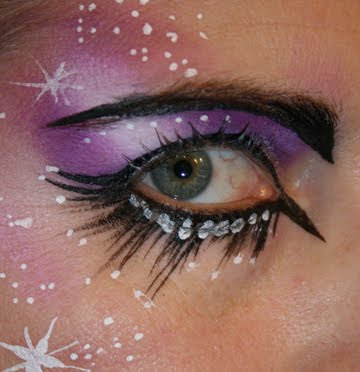 and express a different side of my creative self. 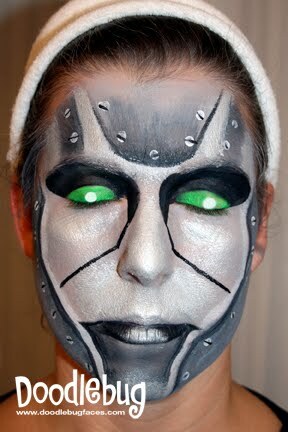 However, having said that, I don't think I would even be face painting if it WASN'T for my computer. I created my website on my trusty Mac, and I am typing this blog entry on my new laptop. 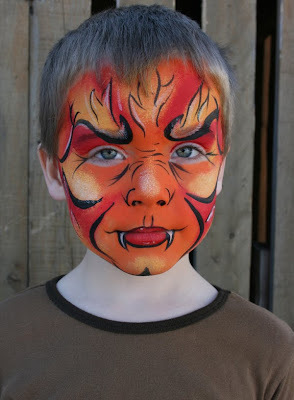 My free on-line ads are what got the ball rolling when I was first starting up (thank you craigslist.ca and kijiji.ca) and I have met face painting friends from Montreal and beyond on Facebook. I have joined forums, subscribed to on-line face painting magazines and signed up for courses all from the comfort of my own home. Then I found Youtube. What can I say, except that Youtube is such an amazing resource for anyone who wants to get started in, or just improve upon their skills as a face painter. 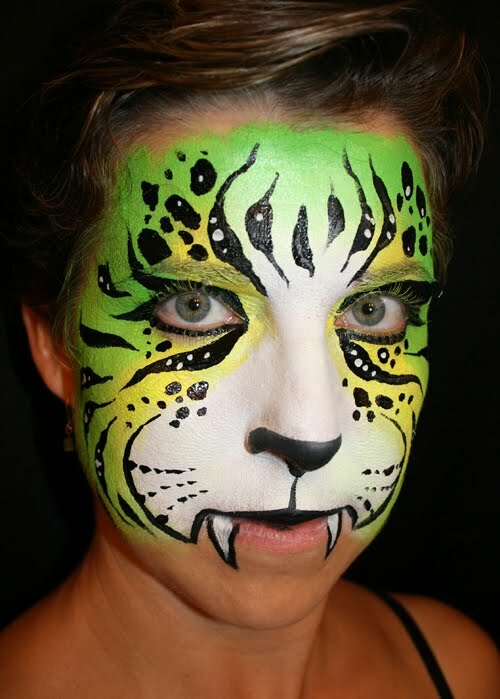 You want to learn how to face paint a cat face? Youtube. How to use rainbow cakes? Youtube. What kind of brush strokes are used to paint roses? Youtube. It is so amazing to be able to watch a master face painter share their techniques and tips through a 5 minute Youtube video. The amount of information out there just boggles the mind. So I'd like to give a big thank you to all of the master face painters and body painters out there who are willing to share what they've learned to allow others to learn from them and improve their skills. You are a real inspiration to me! It looks like the coming spring/summer season is going to be a a busy one! If you are considering booking Doodlebug Face Painting for a coming event, I would recommend doing it sooner rather than later. The weekends are booking quickly and I even have 2 or 3 bookings for week nights from now until June. 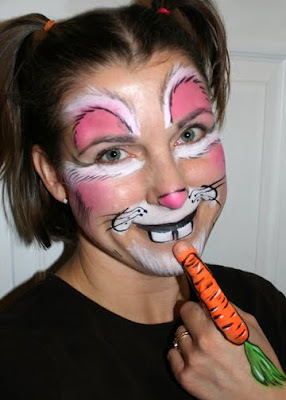 I will be face painting at the NOVA West Island walkathon at Christmas Park Elementary in Beaconsfield this coming Sunday, April 17th from 9-11 a.m. and I will be at the Blacklion Pub in Beaurepaire village on Saturday, April 23, from 11:30 a.m. - 2:00 p.m.
Come on out, say hello and get your face painted for free! I love Easter - don't you? Yes it's true that I love chocolate (who doesn't! ), but I also love the excitement that Easter brings my kids. It's true that Sophie has yet to experience the Easter morning egg hunt (it coincided with her morning nap last year and she slept through the whole thing! ), but she'll be out there this year hot on the heels of her big brother Oliver who is a pro at hunting down colourful eggs hidden in our yard. Just a couple of new faces that I've painted in the last few days. I only wish I had more time to practice some more… Enjoy! 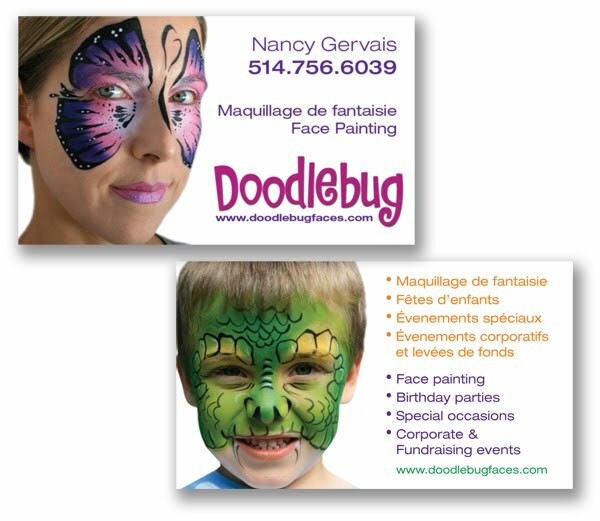 New look for Doodlebug face painting! 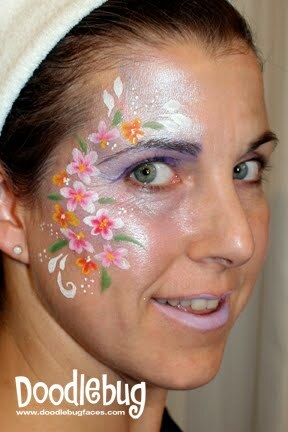 Here's a sneak peek at Doodlebug face painting's new look! I've been toying with the idea of updating both my business card and website for a while now, and while the website might take some time to complete, the new business card was finished in an hour or so. Personally, I love the new look. The white background really makes the images pop, and the photos (of me on the front and my son on the back of the card) are pretty typical of the types of faces that I paint at the average party. I also took a cue from another card that I had seen and added a bit more info rather than just my name, number etc. I'd love to get some feedback, so if you are visiting this blog, please leave me a comment to let me know what you think! Wolfe brothers workshop and more! Wow. It's been a while. I feel like I have totally neglected this blog, but it's been a busy few months for me. Last September, my son started kindergarten and my daughter started daycare. Once everyone was settled in (well, actually, 6 weeks later!) I went back to work full time. I had the good fortune to have spent 15 months on maternity leave with my daughter (one of the perks of living in this province!) but all good things must come to an end eventually. Fortunately for me, I was given the opportunity to work from home, which I jumped upon. I don't miss the commute or the cost of gassing up my car on a weekly basis, but I do miss the social aspect of the office tremendously. At least I go downtown once a week to get a little face to face time with my co-workers! Meanwhile, I continued face painting with regular bookings throughout the fall and winter and recently attended an amazing workshop in Ottawa that was given by the Wolfe Brothers. These twin brothers are master makeup artists. They so rarely come to Canada to give workshops that I could not resist attending their class and so I joined a couple of fellow face painters (Erin and Stephanie) and did a road trip to Ottawa for the day. The class was small (15) and there were a lot of hands on exercises and demos to help us become faster, more creative and more confident painters. My favourite part of the class was the last exercise of the day which involved painting a basic "boy's face" with 3 colours which were then transformed into a multitude of different designs with just a few black strokes. Genius! I came away from this workshop feeling really inspired. It's obvious that Nick and Brian love what they do and their enthusiasm was so infectious that when I came home that night, I could hardly sleep as my brain was so busy processing everything i had learned from them. If they ever come to a city near you I would highly recommend that you take their workshop! Now, I'm off to practice my shading — bon soir! Begun by Montreal face painter Nancy Gervais, Doodlebug’s aim is to bring a smile to every face – one doodle at a time! From colorful cheek art to creative full faces, Doodlebug does it all!